Maybe it's just me, but out here in East London it certainly seems to be that there are more women on the roads since summer? I'm so hesitant to call a trend without statistics to back it up, but if there is an increase in the number of women riding long may it continue. It's worth noting that in both the Netherlands and in Denmark female cyclists outnumber journeys by bike made by men. It really is the home of the bike-borne super Mums! I have no evidence base, but like you the daily ride would suggest a greater number of female riders than last year. Although there are just more riders in total my impression is that the proportion of female riders is growing. Long may it last. Go Girls!! Thanks Tim. That's something I hadn't thought of; are there more women simply because there are more riders? Does the gender split remain the same? Even if it does it still means there are still more female cyclists on the road (great!) but that the % balance between men and women cycling may remain the same (not so great). Interesting stuff! I’m not sure there is any way to say this without sounding insensitive, but I will try. I think it is true that there are more women out on bikes, at least for the daily commute, than there were a year ago, and the male/female ratio has improved. The ratio which has not improved though, in my own anecdotal experience, is the one between female “cyclists”, and “women on bikes”. Virtually the whole of the growth seems to me to be at the lycra end of the spectrum, with women who exhibit much the same traits as similarly clad male cyclists. In other words, the season’s victories in racing cycling may well have inspired the fast and fearless who were already weekend sportivers to extend their riding to the daily commute, but I am not seeing many more “girls on bikes” in chic everyday clothing, flowing hair and step-over frame bicycles. Which is no great surprise. The summer’s events have certainly not made London’s roads any more pleasant or less intimidating to ride. 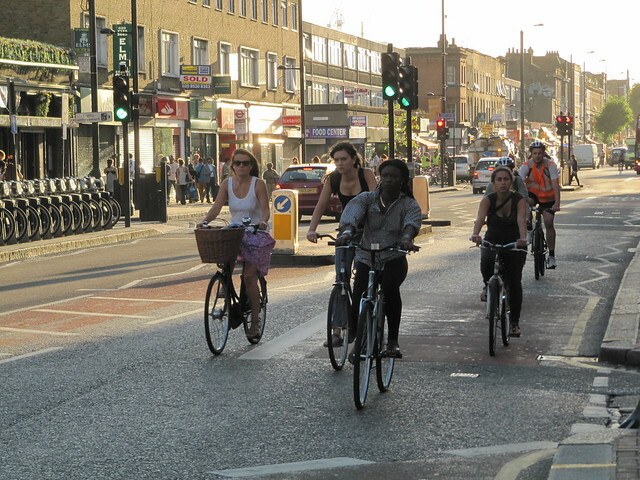 As a woman who got back on her bike over 4 years ago I have gradually seen an increase in the numbers of women 'non-sporty' bike riders across London. But sadly still low in numbers in Greenwich where I live. Hopefully this will change as Mayor BJ has named Greenwich as one of the pilot boroughs for cycling improvements.